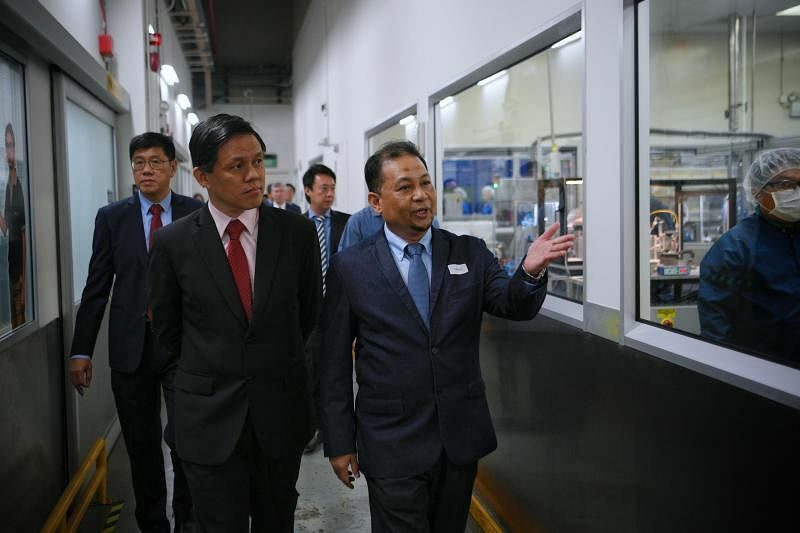 SINGAPORE - Manufacturing will remain a key part of Singapore's economy although it will encounter greater disruption in the years ahead, said Trade and Industry Minister Chan Chun Sing on Friday (Jan 11). Manufacturing makes up a fifth of Singapore's overall economy but there have been predictions that this will be a gloomy year for the sector. Mr Chan, who also visited local vertical farm Greenphyto in the morning, noted: "If we can get these few ingredients right, I have every confidence that manufacturing and advanced manufacturing will continue to grow from strength to strength in Singapore." But the pursuit of better products, company performance or economic growth is not the end in itself, as workers must ultimately benefit by picking up new skills, taking on higher productivity tasks and drawing better pay cheques as a result, he said. Becton Dickinson plant management director Hashim Baba agreed, citing his company's culture of specialised training and worker development as reasons he stayed on with the firm since it set up its Singapore headquarters three decades ago. The company also sponsored his Master of Business Administration course. "It is difficult to find Singaporeans willing to put on a uniform and work in manufacturing in Tuas," said Mr Hashim, who started off as a technical specialist with a polytechnic diploma in mechanical engineering and now manages a plant with 950 staff. "To retain talent in manufacturing, there must be an engaging company culture and a system that trains its staff in all sorts of skills." The new centre will also boost the Becton Dickinson's competency in manufacturing, reducing the reliance on manual labour by at least 50 per cent, said executive vice-president and president of greater Asia James Lim. Around 120 of its 1,500 staff have undergone career training programmes with estimates that up to 500 workers will be reskilled and redeployed to technologically advanced roles by 2023.